How Did My Relatives Get Around? 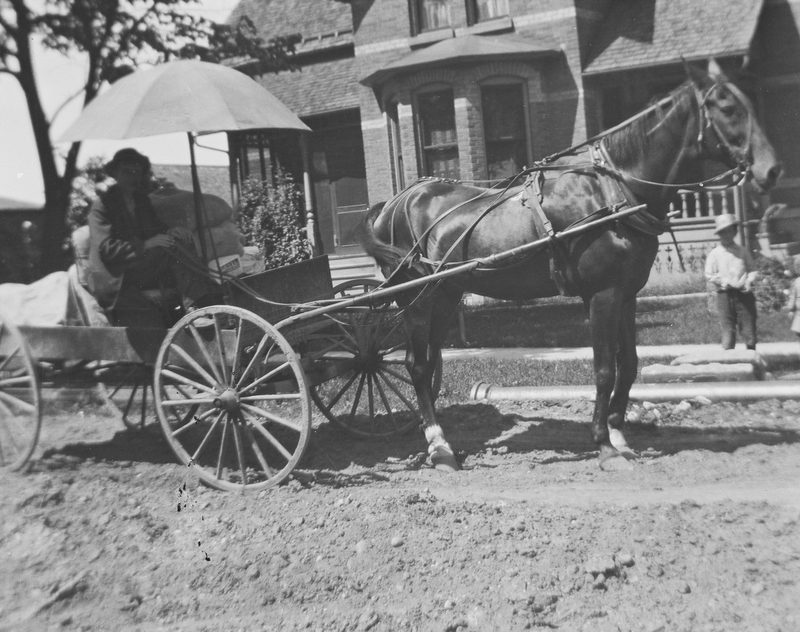 Here are a few of my family photos showing their methods of transportation one hundred plus years ago in Kalamazoo, Michigan. These first two photos (above and below) seem to be the same wagon, but is it the same horse? This house is Richard DeKorn’s house, so I am going to guess it was his wagon and horse. 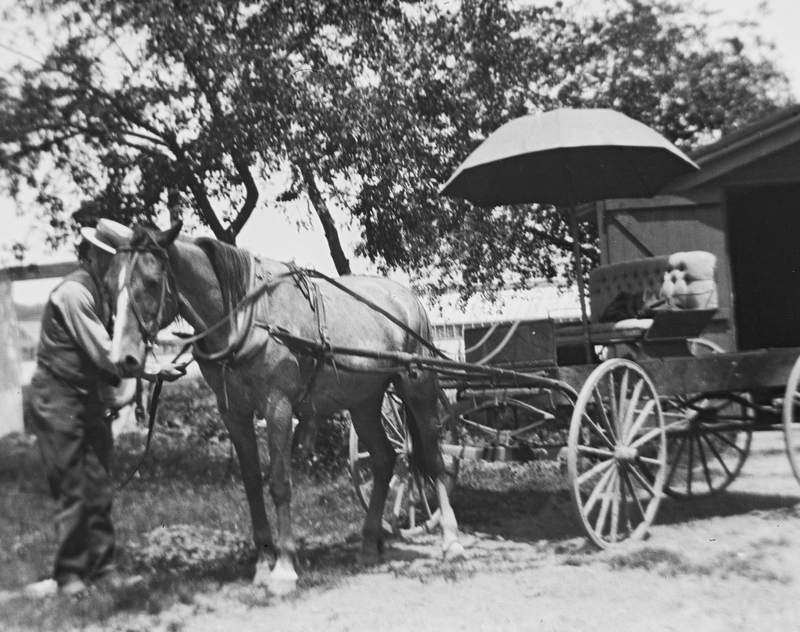 The wagon looks fairly comfy with the upholstered seat and the umbrella. This next one is also at Richard DeKorn’s house (on the left in the photo). 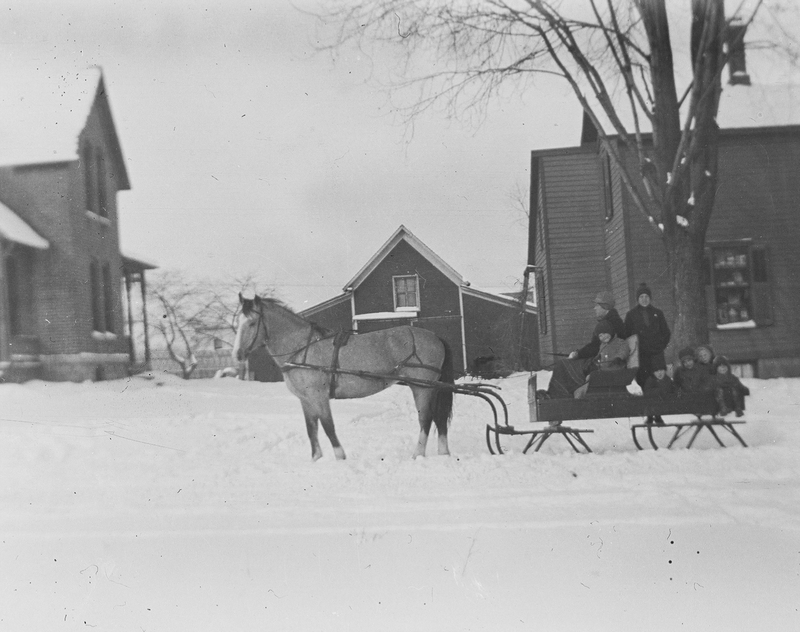 It’s a horse-drawn sled, necessary for getting around in the winter! This last one could have been taken out in public as the two men on the right side of the photo are not posing for the shot. 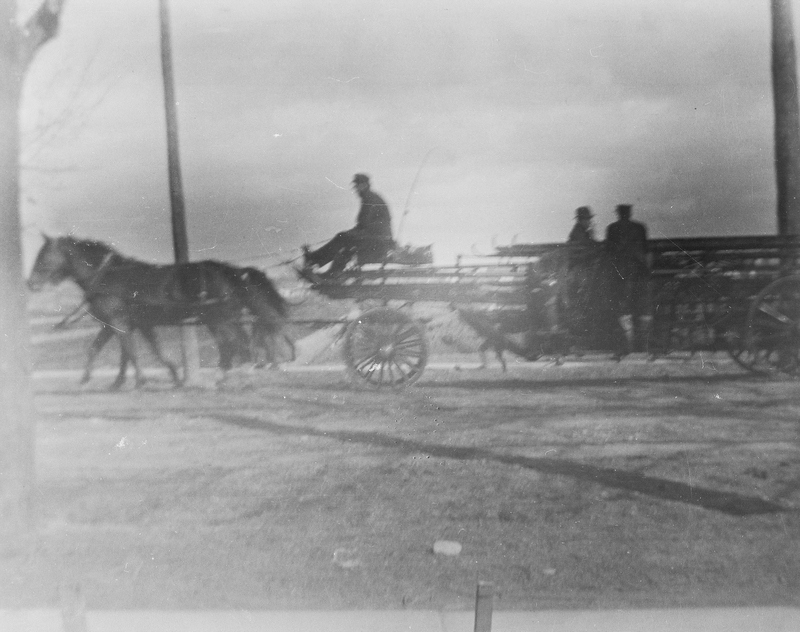 This wagon is not plush like the other and is pulled by a team of two horses. It appears to be more of a work vehicle (like a pickup ;)), but the pole jutting up from the bed looks suspiciously like a fishing pole. You are all good at finding things in photos I haven’t seen. What have I missed? Those are great photos, Luanne, What a wealth of family photos your have!! I especially liked the horse with sled. I do, too. And there is one out in front of the fish market that is amazing. I thought I had posted it a long time ago, but now I can’t find that it’s on the blog. Hmm. Great photos of early transportation! I’m jealous! I do know my relatives regularly maintained and painted their buggy but I have no pictures of it. I definitely see the fishing pole…maybe he was planning to catch a lot of fish and needed the wagon for carrying it back…or perhaps he didn’t want the nicer buggy to get all smelly from the fish. Mrs. P, I realized these were marvelous only recently. I was always looking for the faces in the photos and then realized how beautiful these other ones are–and how much they show about life back then! I’m glad it’s not just me about the fishing pole, that it looks that way to you, too! It’s hard for me to tell about the horses because I don’t know enough about horses. Does the horse with the sled look like a different color than the other? What makes it difficult to tell is the lighting which can make the color look darker or lighter and the angle of the face shows more or less of the picture. My guess is based on the white coloring on the head and legs…hard to tell. I am not a horse person either so my guess might be way off. The photo’s are so picturesque. I especially like the one with the sleigh in the snow. It almost has a Currier and Ives feel to it. It does, Sheryl! I couldn’t put my finger on it, but you said it beautifully! I would make a beautiful Christmas card :). Such wonderful photos. I’ve found some casual references in writing to my ancestors’ horse-drawn wagons, but no pictures. What a blessing! Thanks for sharing them. Like the others, I love the one in the snow. Thank you so much! I am so thrilled to have them! And being connected with my great-great-grandfather’s house, too–very special.